Look at those cookies. Aren’t they gorgeous? Can you believe they are gluten-free? So many people settle for lousy food with no real taste, because they believe that is all they will find when they have to eat gluten-free. I’m here to tell you — silly. These peanut butter cookies are some of the best I have ever eaten. In fact, I cannot have them around the house too much, or else I will nibble on one after the other while I am typing away. However, for special days…. I made up this recipe, about a month ago, after catching the last half of a sentence of a woman on the street. 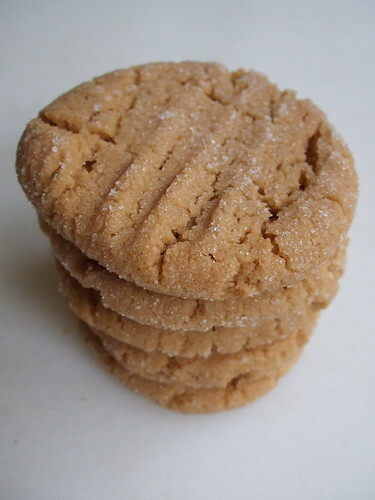 As I walked past her on the sidewalk in Madison Park, I heard her say, “…don’t need flour to make peanut butter cookies…” She walked into a store with her friend, and I didn’t hear the rest. It doesn’t take much more than that for my mind to start racing. However, if you want a real treat, you should eat dessert at the Chef’s restaurant. He loves these peanut butter cookies so much that he started making them himself. He serves a little stack of them with chocolate mousse and a bittersweet chocolate sauce, as a parfait in a martini glass. Now that is decadence. thats the only word to describe these cookies! Those are freakin’ SPECTACULAR. I just might make them this weekend. You know what makes them even better? gf/dairy-free chocolate chips! about 1/2 cup works perfectly. mmmm…. I keep having people send me your link since we’re a bunch of gluten-free girls living here. I just keep forgetting to click on the link. glad I came over! Shauna, your cookies look lovely, and The Chef’s way of serving them sounds tempting! Are you using “natural” peanut butter in this recipe? Or the, uh, fake stuff? That dessert at the chefs restuarant sounds to die for… I am so bummed… cause I almost went there for dinner last week before I left town– I am going to have to make sure to come back to Seattle to try it!!! Your almond butter variation sounds amazing! 2 quick baking questions: You say to cream the PB and the sugar in a bowl. Do you use all the sugar to do this? I ask because later you say to roll the ball into white sugar – is this more white sugar? Also, do you mix and beat all these ingredients by hand or just cream the PB and sugar by hand? Try using Splenda instead of sugar for more calorie cutting. You won’t taste the difference. Yummy! I hope you won’t consider it an insult when I say these taste like the inside of Reese’s Pieces:). I don’t have celiac but I don’t think I’ll ever go back to making PB cookies the gluten way ever again. Three cheers (at least)! I did some math… which is scary… and calculated that if you make the cookies small (my batch made 25 cookies) their only 115 cal per cookie! Not bad! I just found out last week that I had celiac. I just made these cookies and they are exactly what I have been looking for for years!! Regular peanut butter cookies have never been peanut buttery enough. Thank you so much for sharing this recipe!!!! I can’t wait for my husband to get home so he can try a cookie. . I just found out that I have celiac last week. I just made these cookies and they are exactly what I been looking for for a looong time. Peanut Butter cookies with flour have never tasted peanut buttery enough. These do! I love to cook and am looking forward to trying more of your recipes!! I can’t wait for my husband to come home so he can try a cookie. I am having to fight my 20 year old son to keep out of them:) Thank you for sharing this recipe!! Oooh yes. I just had a double blind taste test — David Lebovitz’ PB cookies (with gluten), versus these ones. Yours won! (But David’s are good too, of course!). I went gluten-free two weeks ago (would have been nice to know about this whole gluten intolerance bizness 10 years ago when I was diagnosed with IBS and told to “reduce stress” to reduce symptoms, which never worked) – and this was my first baked treat. THANK YOU. I was a bit worried that I was condemned to a holiday season spent coveting those yummy cookies w/ the chocolate kiss in the middle, but I’ll just make my own version! I sometimes make these with honey instead of sugar–just use 3/4 cup to 1 cup of honey instead of the sugar. Even with the extra liquid the cookies come out fine. I’ve been gluten free for a little over a month, but I’m also sugar free, dairy free and egg free. I made these cookies with splenda and I love them! The only thing, is I wouldn’t roll them in Splenda the next time, I would just sprinkle some on top. I was looking for something sweet, and I’ve finally found it. They are so easy, and I bet they would be awesome with some sugar free/gluten free chocolate chips! Thanks for the recipe. You can see the original post here: Flourless Peanut Butter Cookies but I’ll let you know when I use one of those flavored peanut butters (they’re gluten-free as well!). Being a college student, it’s always great to find quick and easy gluten-free recipes like these! I made them with raw sugar instead of granulated white sugar—gives them a bit of a crunchy texture. Yum! Thanks for all your wonderful recipes! i’d love to try them—do you think i can substitute agave nectar for the sugar? should i use less egg to compensate for the agave liquid? Look delicious! Great peanut butter. mmmmmmmmmmmmmmmmmm… that’s the only word to describe these cookies! Cookies you eat with a spoon??Help! I tried this recipe twice in the last 2 weeks and the cookies turned to dust each time. (dont worry i didn’t throw them away..it still tasted good! )The only thing about the recipe i changed was that I used Splenda instead of sugar and a “Natural” PB instead of the regular kind. Im doubting it…but could either of these have made the cookies not “stick” together? Is there a certain brand of PB i should use? Thanks !!! Thank you so much! My son and I are going GF, he’s 5 and pb cookies are his (and my) favorite thing on earth! I used organic natural peanut butter and did have a bit of trouble with them being more crumbly than I like, but they were yummy! My boyfriend and friend were teasing me about not baking cookies over the holidays – really, I think they were just hoping I'd make some. It's Christmas Eve and all the stores were closed. I needed to find an easy recipe and found yours. I didn't have an egg so I substituted egg replacer and the cookies turned out amazing! And my loved ones were surprised by what I could turn out in 15 minutes! Thank you for your help. Seriously. I made FOUR batches of these this weekend. EVERYONE loved them (GF or not). Amazing…thank you sooooo much for sharing! If the cookies crumbled, a few different things could have happened. The egg was too small. If you used a medium sized egg, I don’t think it’s big enough. Also, you have to use baking powder. There isn’t any acid in the recipe to interact with baking soda. I made these cookies last week with Peanut Butter & Co's Dark Chocolate Dreams GF peanut butter….they were fantastic! Thanks for all your yummy recipes! I am going to try this with their cinnamon raisin swirl next, can't wait! These are so so so good…thank you, Shauna! I 'used to' hate creamy peanut butter. Now I know it's good for and in something! Hello from the UK – a good 4 years after your post! I'm thinking about going gluten free for a month to see if it helps with various health and energy issues, but was feeling pretty depressed last night when I thought about a world with no pizza, bread, or my usual baked goods – I'm an avid home baker. I then wondered if peanut butter would be allowed, so I googled it – and your post came up. Just baked these this morning in a sudden rush of energy before work, and they are delicious. I made a half batch as I was low on pb – I didn't have quite half a cup, so I whizzed some pecans into an almost butter. I used one small egg, but the batter was a little runny (as I guessed) so I stirred in a bit of gluten free cornmeal until it thickened up. They baked up beautifully. Yeah, you should be using granulated sugar for this recipe. I am so happy I found your blog! I am going gluten free for the next 6 months (and if I see improvement then forever) I love to bake and experiment in the kitchen and thought those days would be over but your blog and recipes are my silver lining! Thank you! I have been gluten free for about a year and half now. Your Blog was one of the first I was introduced to and I have to say, you are an amazing woman and a big help. These cookie’s were the first thing I tried and the whole patch went before they got cold!!!! Everyone ask me for the recipe after just one bite and I tell them there is only 4 ingredients. Looking forward to trying different things with this, like the hazelnut and chocolate chips. This is the first time I every commented on anything. Thank you so much!!! Such a wonderful recipe they are delicious!! I was a bit skeptic at first because it was totally flour-less and now I think screw flour! YUUM! Wondering if you have ever thought about food allergy testing?? Best thing I have ever done. It is a simple blood test, but “regular” doctors do not know about them. I went to a Naturopathic Doctor- licensed, he is the best thing that has happened to my family. For me and other family members, the weight came off naturally. How amazing are these cookies!! And insanely easy! I rolled them in a mix of brown sugar and cinnamon that I had left over from baking cinnamon rolls yesterday! Also used crunchy peanut butter. YUM! Hi Lissy, I have read in a book by Patrick Holford (nutritionist), that a lack of zinc can bring on abnormal cravings for carbohydrates and sweets. I used to crave sweets all the time (would eat 3 or 4 packs biscuits a week) and since going gluten free and taking a lot of supplements as required by the nutritionist I have lost weight and hardly ever feel the need for biscuits. I ‘ m gluten free and there the best peanut butter cookies I ever tasted. Thank you for putting this on the web. These cookies are perfect! I thought I would try the recipe substituting honey for sugar, as was suggested above, but as I suspected, they turned out completely different in taste and consistency. Why mess with a good thing? I got an urgent plea from my sister (i fancy some peanut biscuits badly – dreaming about them) this morning for gf peanut butter cookies without any complicated flour sent her the link and tested them myself. Excellent, especially spread with melted dark chocolate to cut the sweetness. A tasty suggestion – add a generous amount of cinnamon to the sugar before rolling the balls of dough in it. It makes for a delicious variation on the traditional cookie. And even better, I was surprised, was this recipe made with almond butter! I brought equal numbers of peanut butter and almond butter cookies to a party and the almond butter ones disappeared at record-breaking speed. Even amongst the peanut butter lovers! Wow! These are amazing. My kids loved them so much I had to triple the batch! Thanks so much, finding good gfcf desserts is a real chore! I made these last night and melted chocolate chips on top, like your almond butter cookies, IN love! This was my 1st gluten-free baked good! Thanks so much for all your hard work and inspiration. I love baking and I’m so glad to have this inspiration to keep doing it – Gluten Free! 🙂 PS My family gobbled them up and then asked for more this morning. Happy faces! *drools* thanks for the recipe, love your blog!!! Yummo, was delighted to find and make these. In the great land of wild Alaska w/no flour but lots of pb! Added vanilla and chilled the dough. Had lots of help making and eating with my 3 yo son. Seriously considering the GF lifestyle…will check out more of your site soon. I am so trying this! I just went grain-free and was itching for some cookies… this ought to do the trick! I haven’t had peanut butter cookies since my mom made them when I was a little girl. Since I have been gluten-free, I hadn’t even considered the possibility of having one that would due justice to my memories. They taste just like I imagined … and they are gluten-free. Now, I just have to find a good hiding place for them so my three sons (and husband) don’t finish them off in one sitting! Thank you for bringing back a great (and delicious) memory. Just made your recipe, with a bit of a twist. I found Nestle Peanut Butter & Chocolate morsels in the cabinet, and I am using splenda and a hint of cocoa-powder. Kelsey, if you are concerned about calories, this recipe should cut them in half again, so you dont have to down-size your cookies : ) They turned out fantastic, and since PB & choc is one of the greatest combos known to man, I thought I would share. I found that adding an extra egg and 3/4 cup of brown rice flower makes a more nutritous cookies (if that matters much), and seems to resemble the traditional peanut butter cookie a bit better. Cheers. then made my own version based off of your recipe as a start, because I like the baking powder…to a double batch of your cookies I added 1 cup of cocoa powder, 1 egg and enough oil (1 tbl at a time) so that the batter was moist enough to stir in 1 cup of chocolate chips. Make sure they cool on the cookie sheet so they do not fall apart, otherwise they turn to crumbs. Why did my cookies turn out flat? I just made these for my son’s friend, who has to eat GF. They were a hit with all the kids who were playing together today. I’ll definatey be making these again. I shall bring an American classic to my German colleagues tomorrow, on Thanksgivin’! These pb cookies are to die for! We eat gluten but my father-in-law was recently diagnosed celiac. So I look for good recipes and try to always have gluten free options on hand in the house. I made these for him for his Birthday and it was all my husband and I could do to not eat every cookie! We loved them and more importantly my father-in-law loved them. Thank you for the wonderful recipe and I will be trying many more I’m sure! I made these with the chocolate kisses for Christmas and they were a big hit! I times the recipie by 4 and it made about 72 cookies. They did not last long and everyone asked for the recipie. I will definately be making these on a regular basis! I baked these for the first time, and I had a little trouble telling when they were done, so I thought this may help. When the first cookie cracks, pay attention. If you start to see small bubbles in the others and lips starting to form around the edges, they are probably done. Not all of my cookies cracked. Also, make sure that your cookie tray is on the top rack because some of mine burnt on the bottom in the first batch. I just made these cookies again. They are SO chewy and SO easy to make! My daughter and I love to make them. Just made these with my son and they are AMAZING! I did 1/3c each of brown sugar and regular sugar plus added a splash of vanilla as per others suggestions. I used natural peanut butter, since we have a truckload of it right now 🙂 I also I made them super tiny and got 32 cookies, what a treat! No problems with texture… LOVE! No doubt about it — these are amazingly delicious, whether or not you’re eating gluten-free! I make a double batch of these delicious cookies with a little vanilla and a mix of nut butter (peanut, almond, and/or cashew). Then to 1/2 the batch, I add cocoa powder, espresso, and a little Nutella. Yum! I call them Gluten Free Nutty-A-Gogo Cookies! My husband just discovered last weekend that he’s gluten, dairy, and egg intolerant, so he’s been pretty bummed about his food choices. When I found these, I pretty much jumped up and down on the spot. I subbed a 1tbsp flax, 3tbsp water mixture for the egg, rolled them small so I got two dozen, and baked them for eight minutes – and they’re AMAZING! I can’t wait for him to try them when he gets home. Hopefully he’ll feel a little more optimistic. I wish I’d never found this recipe! I’ve been making these cookies about once a week (sometimes more) for the last couple months. Sometimes I don’t coat them with sugar–and I think I like them better that way. Last night I found I only had about 3/4 cup of peanut butter, so I used Nutella for the rest, and the cookies still turned out great. Seriously, I have a love-hate relationship with these cookies! This is a fantastic recipe. Made these delicious cookies this afternoon with my niece and nephew and they loved them. Thankyou! The cookies look yummy! I hadn’t thought of using M&M’s with peanut butter cookies. What a great idea. And I added gluten free quick oats too bc the batter was pretty loose! Can you substitute other nut butters for the peanut butter? Thank you for this recipe. These are amazing. I just made these and they are wonderful! Although, I think I made mine a little smaller than I should have, I ended up with 40 cookies. They are perfect though! So soft and moist. I ran out of natural peanut butter and had to use Jiffy, but they were still amazing. I cannot wait to try them with natural peanut butter! Has anyone tried making these with egg replacer?? Very delicious! I doubled the recipe and because I didn’t have any chocolate chips, I put in 1/4 cup of unsweetened cocoa. It gives them a nice undertone of chocolate flavor and I didn’t need to add any extra sugar. I also try to stay away from the refined sugar and will try other sweeteners too. Wow, these are so filling! I used a melon baller for size control and it made more than 20 cookies. I replaced half the white sugar with brown, then I rolled them in demerara sugar. I used up the remains of three different kinds of peanut butter. My house is less than 40% humidity today and the batter was so dry it wouldn’t hold together at all. I added a tablespoon of water and it was fine. I love cookies and I’ve had no wheat since July. The only cookies I’ve had since then were commercially made. Every one of those tasted so bad I didn’t want a second cookie. These are far better than any of those!!! I ate THREE…and I am so full.